An animal bite can result in a break in the skin, a bruise, or a puncture wound. If the bite is a puncture wound, it has a greater chance of becoming infected. Rabies is a rare, but potentially fatal, disease transmitted by the saliva of a rabid animal. If you believe an animal may be rabid, notify the proper authorities. DON'T go near an animal that may be rabid. Examples include a raccoon who is active during the day, a stray pet, an animal that is acting strangely, or one who bites unprovoked. Be particularly cautious with bats. Some doctors believe that any potential contact with a bat, even simply seeing a bat in your house, requires a rabies vaccination. There is no cure for rabies once symptoms develop. But, if vaccinated promptly after being bitten, you can develop immunity before symptoms develop. If you believe you may have been exposed to rabies, you must get vaccinated immediately. Studies have shown that in cases where a person contracted rabies from a bat, many of the victims were not even aware they had been bitten by a bat. If you see a bat in your house or a bat touches you in any way, you should contact a health care provider immediately for advice. Many animal bites, even if rabies vaccination or stitches are not required, should be treated with antibiotics. 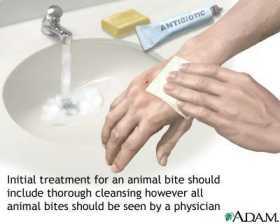 Animal bites to the hand or fingers especially warrant antibiotics. If you have any doubt about the need for treatment, seek medical care. Pets are the most common cause of bites, with dog bites occurring most often. Cat bites may have a higher chance of infection (due to their longer, sharper teeth, which can produce deeper puncture wounds). Stray animals and wild animals, such as skunks, raccoons, and bats, also bite thousands of people each year. In addition, certain diseases can also be transmitted through bites. The symptoms of these may include flu-like symptoms, headache, and fever. Calm and reassure the person. Wear latex gloves or wash hands thoroughly before attending to the wound. Wash hands afterwards as well. If the bite is actively bleeding, apply direct pressure with a clean, dry cloth until the bleeding subsides. Elevate the area of the bite. If the bite becomes infected, call the doctor or take the person to an emergency facility. Call 911 if the person has been seriously wounded -- for example, if the person is bleeding significantly and it will not stop with simple first aid measures. Mandell GL, Bennett JE, Dolin R, eds. Principles of Infectious Diseases. 5th ed. New York, NY: Churchill Livingstone, 2000:3202-3204. Marx JA, Hockberger RS, Walls RM, eds. Rosen’s Emergency Medicine: Concepts and Clinical Practice. 5th ed. St. Louis, Mo: London: Mosby; 2002:774-780.